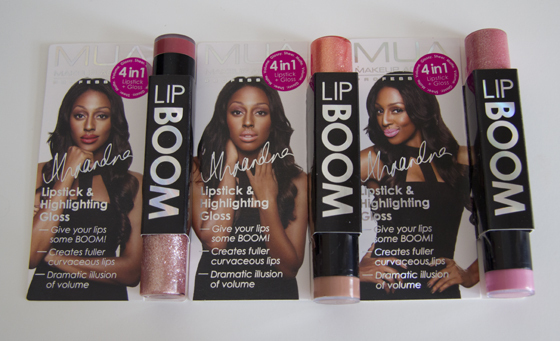 Recently MUA and Alexandra Burke have collaborated and designed the 'Lip Booms'. They had created 8 different shades, which had been chosen by Alexandra. 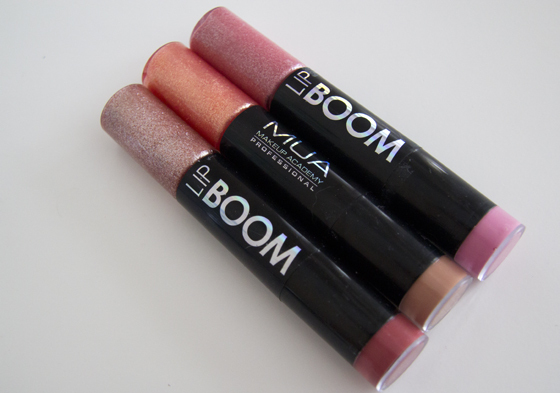 The Lip Booms are 4 in 1, which is very handy, if you want to create different looks using one product. The looks you can actually create are (1) Lipstick alone for a matte look. (2) Lipstick with highlighter applied just to the centre of your lips to create a full volume illusion. 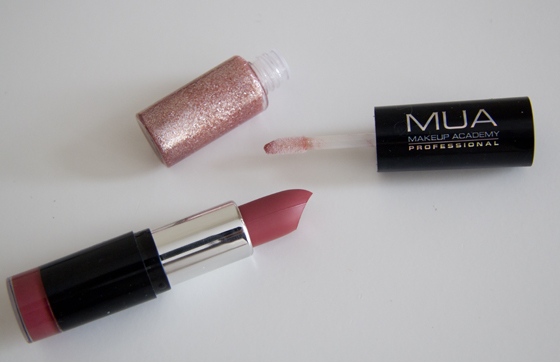 (3) Lipstick with highlighter all over for a super-glossy look. (4) Highlighter alone for a sheer pearl finish. This is also the way I done my swatches and the way I had numbered them. 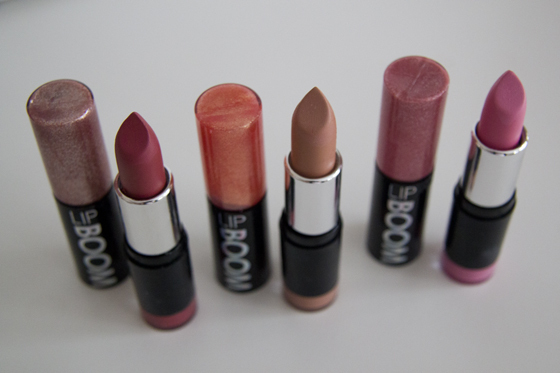 The lipstick are matte and I must mention that they have very creamy formula, it's also really nicely pigmented. They don't dry out my lips, as well as they don't get into the fine lines. I'm not sure about people who have dry lips, as mine are normal. The lipgloss smells amazing! The smell reminds me of the Lancome Juicy Tubes. Lipgloss isn't sticky, but I find the glitter particles a bit to big for my liking. My favourite colour is the Pale Pink "Cheeky". The packaging isn't amazing, but I still find it very handy. 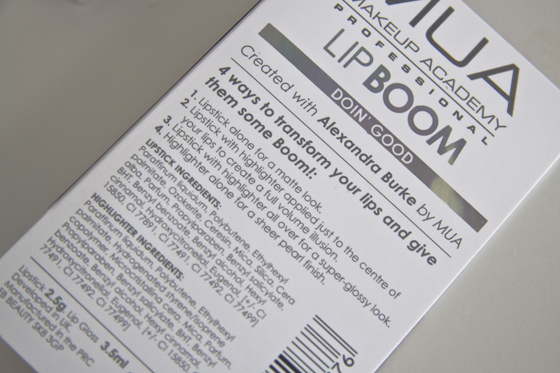 You can also swap the colours of your lipgloss, but adding a different lipstick on top. Overall I do think that the lipsticks are worth the £3. I'm sure that all of you will find a perfect colour. I like to wear the lipstick with a bit of lipgloss. 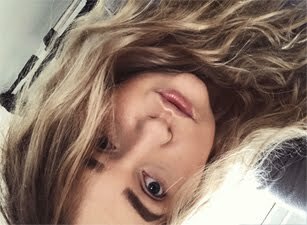 By the way I wanted to apologize for the way my skin looks, I think you all know the London weather now, the lighting in my room kept on changing. Any idea what on earth the stuff is in the pot that detaches from the bottom of the lipstick?! I've just got one and really don't get what that is supposed to be! the colors are awsome! :D loved your blog so I decided to follow,you´re awsome! I don't have of these but they seem great. MUA never fail to impress me it seems! These look great, I love the packaging. I may have to try one out, you can't say no for £3!